Society of Certified Senior Advisors: What is Hospital Discharge Planning? Senior care veterans know that most families are in a time of crisis when they start looking for senior supportive services. One of the most common instances is after an acute stay or procedure at the hospital. Often it is during the discharge planning process that seniors and their families find these supportive services. Successful discharge planning can be the difference between a successful and disastrous senior living transition. First, here are some basics on the process. Discharge planning happens while you are in the hospital. Hospitals that participate in Medicare and Medicaid are required to provide discharge planning, although what that looks like varies depending on the size of the hospital and your level of need. Discharge planning can include a range of activities such as: (1) scheduling follow-up appointments with primary and specialist physicians; (2) setting up home supportive services; (3) ordering supportive products like wheelchairs and oxygen tanks; (4) arranging short-term respite stays at senior living communities; (5) evaluating the patients prescription coverage and coordinating other insurance-related issues; (6) directions on health conditions and how to manage them at home, and (7) resources and education on supportive services and programs once you transition out of the hospital. Discharge planning ends when you leave the hospital. Ideally, at that point, arrangements have been made for transitional care into a senior community or at home. Why Is Discharge Planning Important? Discharge planning may seem trivial after the drama of a hospital stay. Depending on your needs, it can be as simple as prescriptions and written instructions for follow-up care. In many cases, however, hospitalization is only the start of the journey. If you have suffered a stroke, for example, you probably have a lengthy and complicated recovery ahead of you. The transition home is even more complex if you have multiple health challenges. In these cases, discharge planning is critical to make sure everything you need is in place when you return home. Good discharge planning can improve the coordination of care, make your recovery easier, and decrease the chance that you will need to be re-hospitalized. 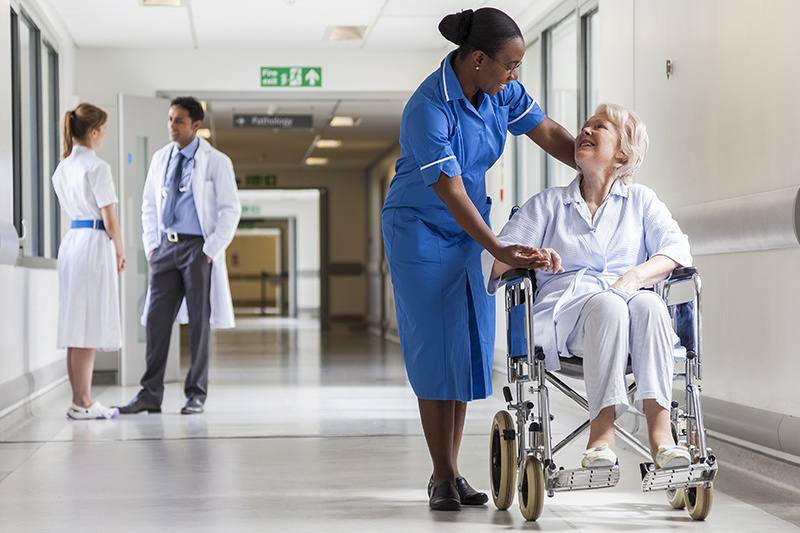 Most discharge planning is done by a nurse or a social worker on staff at the hospital. Social workers are uniquely positioned to provide effective discharge planning for a number of reasons. They are able to assess and address all of their patients needs, including but not limited to medical needs. They work as part of a multidisciplinary team that includes doctors, nurses, and other health professionals. The social worker acts as the patient’s liaison to that team and coordinates information and the efforts of that team on your behalf. She is your voice in the hospital. These social workers can also convene meetings that include you, your family, and hospital personnel to discuss your illness, treatment, and plan for care once you leave the hospital. They can help you and your caregiver become your own best advocate, since once you leave the hospital you will in effect be your own care manager. Social workers also have a strong grasp of local resources and services. They have lots of connections in the community. This means they can help link you with a range of services including financial resources, caregiver support, meal delivery, and other services you didn’t even know existed. They can also connect you to a community-based social worker who can continue to help you after you leave the hospital. Discharge planning is an important part of any hospital stay. If you are hospitalized, make sure you ask to speak to the social work discharge planner to ensure your transition home is as smooth as possible. “Social Work Profession,” National Association of Social Workers. “Transitional Care for Rehabilitation” Seniorly. A version of this article, Hospital Discharge Planning for Elders written by Amanda Woodward appeared in Seniorly’s Senior Living Resource Center.